Looking for assembly instructions? Find them here. This is your resource for finding complete assembly instructions for all Grandio brand greenhouses. You can download the instructions in PDF format or you can view the assembly video. 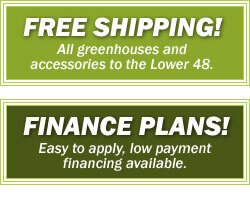 We've provided everything you need to get started with your new Grandio greenhouse. Have questions? Give us a call 1-866-448-8231. » Download: Grandio Summit Manual 1 - Base Kit Assembly Instructions and Installation Best Practices. » Download: Grandio Summit Manual 2 - Summit Greenhouse Assembly Instructions. » Download: Grandio Summit Manual 3 - Itemized Parts List, Graphics, Descriptions and Quantities. » Download: Grandio Summit Shade Net Installation. » Link: Grandio Summit Door Handle Installation Video. » Link: Grandio Summit Auto Roof Vent Opener Installation Video. » Download: Grandio Summit Manual 1 - Base Kit Assembly Instructions and Earth Installation.